The Port of Haikou, situated at the western suburb of Haikou city, Hainan Province, is located in Haikou Bay on the south side of Qiongzhou Strait. With the sea on three sides Haikou enjoys a long coastline that features excellent bathing beaches and sea side resorts. Holiday Beach is the most popular of these, while Xixiu Beach is where the National sailing and windsurfing teams train and hold competitions. The downtown area of the city has an excellent environment with streets lined with coconut palms. Here there are modern and convenient public transport facilities and all that is best in a tropical seaside city that is pollution free and that meets the needs of the tourist in a friendly and welcoming way. 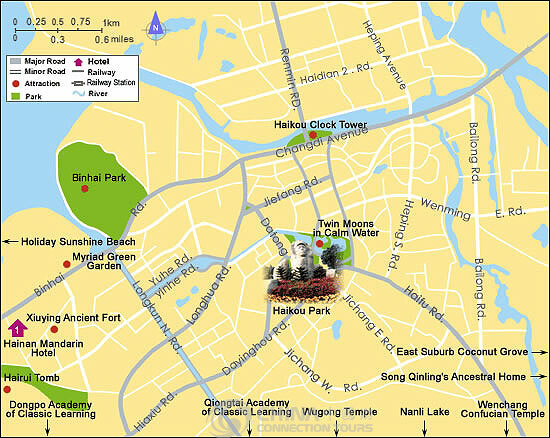 Besides its natural resources, Haikou has a number of important sites of historical interest. The Wugong Temple (The Five Official's Temple), the Tomb of Hai Rui and the Xiuying Emplacement each serve as reminders of the historical importance of Haikou.